Well officially Spring has arrived ( mind you after today I wonder as it was quite cold out in the strong South easterly we had) and the deer are lapping up the lush grass growth in our hunting area. 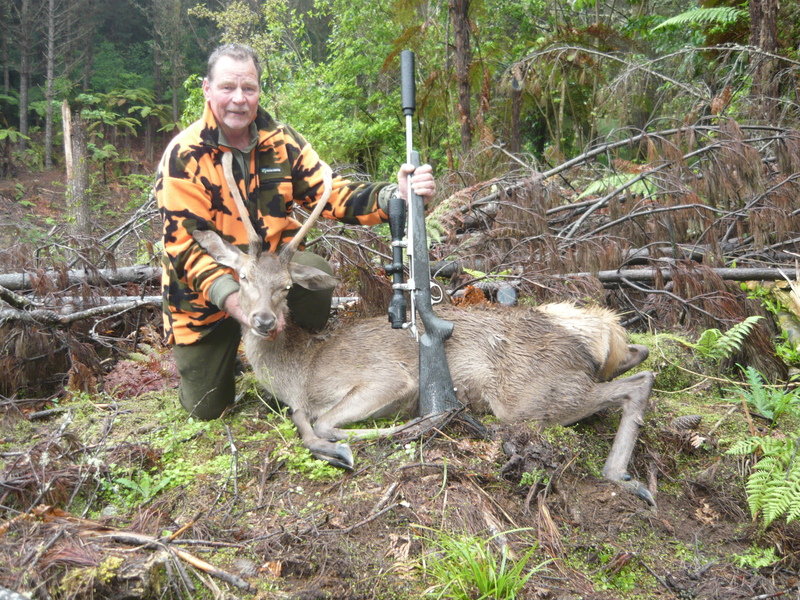 Several weeks back I managed to out smart a young Sambar stag and got him using a 178 gr ELD-X out of my 300 Win Mag, at 50 yards it was on the ground instantly. Last weekend it was another damp one so Beeman and I were cruising the forest looking for a unwary animal or two after checking the camera's. It was early afternoon and raining lightly so we drove up this particular track which had had a fair bit of sign on it over recent weeks. On reaching the skid at the end we seen two spikers bouncing off headed for cover, Beeman was onto them quick smart and nailed the front one as it went over a fallen tree, the other turned at the tree and I missed and then Beeman missed. The spiker made it into the trees but I could still see his head and neck flicking through the trees so I had a whack as he disappeared into the thicker stuff and missed again, needless to say it wasn't my day. Today with rain in the forecast we once again decided to cruise the likely areas rather than walk,(Beeman had sprained his ankle during the week so wasn't to keen to put to much strain on it)After checking a couple of spots and seeing a bit of fresh sign we decided to look at another spot which screamed deer but we hadn't seen a lot out there over the past few years. We drove to the point where the road went back into the big pines and stopped and scanned the clear cut for any late feeding deer. As it was about 7.30am we weren't to hopeful but low and behold two deer burst out of a small gut and scarpered up the face heading for the big trees. Beeman being left handed was able to swing onto them without moving from his seat and deer number two for the 260 was down at 276 yards, the yearling peeled out to the side and I managed a shot off the hood and hit the deer not quite right (gut) so Beeman finished it for me. That was the first deer I have shot with the 145 gr ELD -X in the 270 and considering it was in the middle it wasn't going anywhere so was relatively pleased with the performance . By the time we got home light rain had arrived along with a strong gusty wind but after dealing to the deer and some lunch we headed out for and early afternoon looksee and found several very promising spots so look out next weekend. 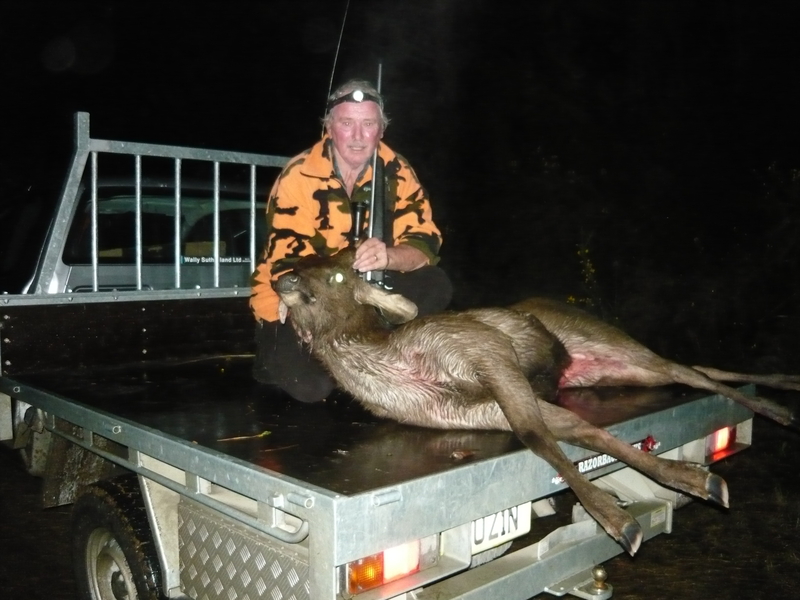 Tahr, outdoorlad, veitnamcam and 13 others like this. 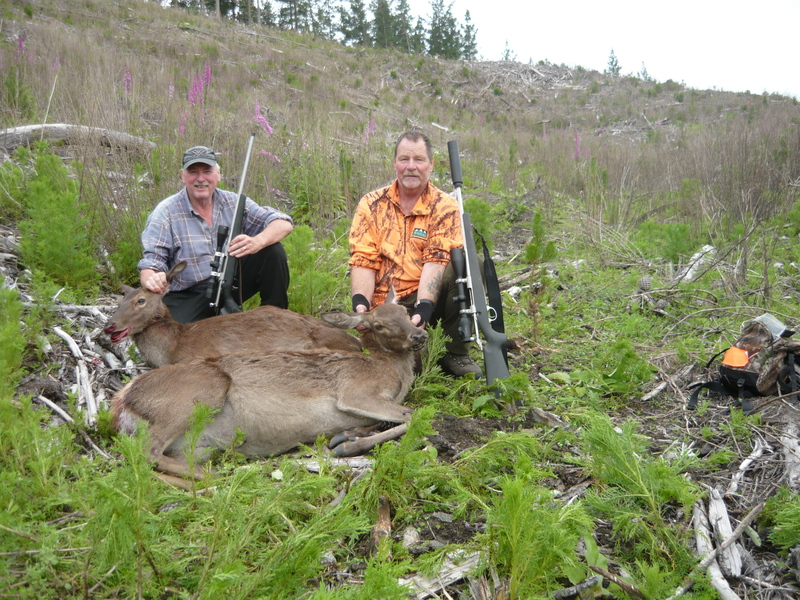 Some nice eaters and good shooting there. Good times! Always good to get the first with a new rifle. What do you do with the Sambar? Do you get it all processed? What are Sambar like to eat compared to other species? Sambar meat isn't as good as the likes of Reds Sika and Fallow (or whitetail probably the best) It is edible and can be made into good small goods, makes nice salami. We tend to give most of the sambar away as we get more than enough Reds for eating. Rusky and BeeMan like this. Go Mooseman, go 260. Stay hard mate .